The thermal insulation system called AeroFoam was developed at the Cryogenics Testbed Laboratory at NASA’s Kennedy Space Center in Florida. 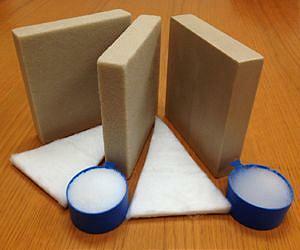 The AeroFoam insulation is made of constituent materials, aerogel particles, aerogel blanket and polymide microballoons. Photo Credit: NASA/James Fesmire. Materials designed with specialized thermal properties have been integral components of NASA’s space shuttles and other launch vehicles for many years. Now, two thermal insulation systems developed by scientists at NASA’s Kennedy Space Center in Florida may have application for future exploration programs, as well as the commercial world. The thermal insulation system known as layered composite insulation, or LCI, and the foam-aerogel composite material, also known as AeroFoam, were assigned U.S. Patent numbers in 2005 and 2010 respectively. Just recently, exclusive research licenses for these technologies were granted to Flexure LLC. Read more: Foam's Future Seen in Space and Industry — Space Daily.